Never mind what the term implies, Real Simple Syndication (RSS) is not simple. At least not for me. I’m talking about being able to subscribe to feeds by clicking on those ubiquitous orange icons to simplify following a website’s updates or a blog’s posts and comments. Why would I want to subscribe to RSS feeds? Time and convenience. All your RSS subscriptions will be displayed on a single page in your reader (with links to the source articles/posts) so you don’t have to visit all those sites unless you want to. This saves a great deal of time because you don’t have to visit each website to see if there’s anything new. It’s delivered to you. When I first learned about RSS, I attempted to use Google Reader but I wasn’t patient enough to figure out what I needed to do to make it work. So I ignored RSS for a long while. If you would like to subscribe to RSS feeds so you can see all your favorite websites’ updates in a single “table of contents” type of style on one page in your browser, then read on and we’ll get you set up in Firefox because this is what I’m using. Don’t be put off by the long post here, I just like to cover all the bases when I’m giving instructions. I recommend that first you read through this procedure to get an idea of what you’ll be doing. Then return to Step 1 and start. Trust me, this is not difficult. Visit Mozilla at http://www.mozilla.com/en-US/ and download and install Firefox. 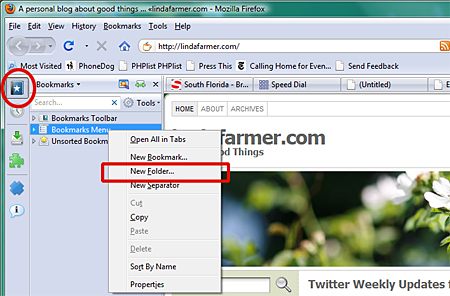 You can use Firefox in parallel with Microsoft’s Explorer if you wish. One does not preclude using the other, you can even have them both open at the same time. Why you’d want to do that I don’t know, but you can. Once you have everything set up, you’ll be able to click on that orange icon and “tell it” to add the feed to your feeds folder … but I get ahead of myself. 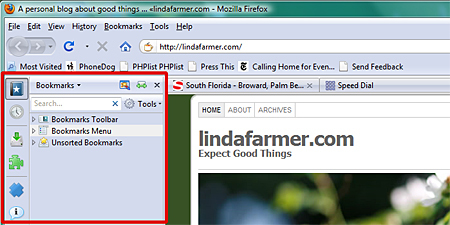 During the installation process, Firefox can import your Bookmarks (Favorites) from your other browser so you will have access to all your favorite websites right away. Okay, got your new browser installed? Let’s get a couple of add-ons. In the future (not now!) you will want to visit https://addons.mozilla.org/en-US/firefox/ to locate and download all the add-ons your little heart desires. Add-ons are self-installing once you choose the Download option, and then all you do is customize them to suit your needs. Check out the list of categories on the left side of the add-ons page, and explore these later. For now, bookmark the page and let’s carry on. We have stuff to do. AiOS – Once installed, this plugin allows you to toggle a sidebar (on the left, below) on and off using the F4 function key on the top row of your keyboard (or using the mouse to click the View menu). When you toggle, you can choose to see your Bookmarks, History (recently visited pages), the progress of current downloads, and your Add-ons in the sidebar. The reason I recommend getting this add-on first is so you can see a list of your add-ons and access their customization buttons easily. Plus, being able to see your bookmarks in the sidebar quickly is really convenient and this is the major feature you’ll probably use most. AiOS has much more functionality that I have yet to explore. The default settings should work fine until you feel like experimenting and customizing. The add-on we want to install for subscribing to and reading RSS feeds, is called Brief: https://addons.mozilla.org/en-US/firefox/addon/4578. 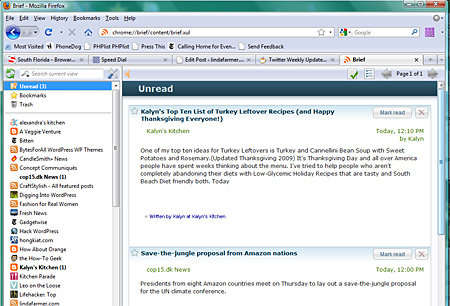 Note that there are other add-ons for RSS feeds available, but this is the one I’m using and describing here. I haven’t experimented with any others. Yet. Having downloaded and installed Brief, you need a place to store the feeds you’re going to subscribe to. 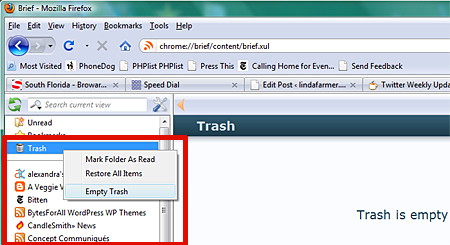 Brief uses a folder in your Bookmarks to store your subscribed feeds, so we need to create a unique folder in Bookmarks for this. After much soul searching, I used a great deal of imagination and called my folder “Feeds”. Obviously you can call your folder whatever you want. Choose the rest of your selections – or accept the defaults. You can always go back and change these later. Now you are all set to subscribe to RSS feeds when they are available. At the top of the browser in the address bar, you’ll see the orange RSS button at the right end of the address. 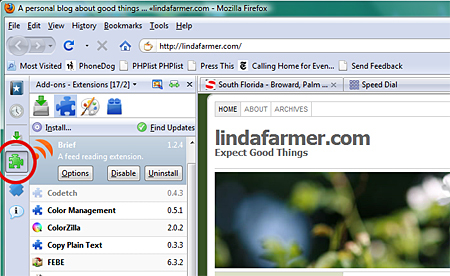 Subscribe to “lindafarmer.com RSS feed” – most of the time, this is your selection. Possibly – Subscribe to “lindafarmer.com – (Title of Post here) Comments Feed – if you are not on the home page, but on an individual post’s page, you will be given an opportunity to subscribe to that post’s comments so you can follow what others are saying about that particular post. It’s a good thing. But let’s assume we are on the home page and want to subscribe to the blog’s new feeds. 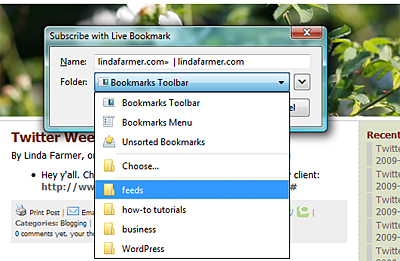 So click the first choice and a window pops open and select your “Feeds” folder to store that feed subscription. In the bottom right corner of your browser you will immediately see the feed icon being updated with the number of new feeds you have waiting to review. When you initially subscribe to a site you may get a dozen or so new feeds – this varies depending on how many articles the originating site has set for new subscribers to receive. (I have very few because my output is not prolific.) The feeds don’t go away until you delete them, so there’s no panic to view them. But let’s look now anyway. Click on that bottom right icon, and a new tab, labeled “Brief” will open in your browser with your feed subscriptions listed down the left side, and the reading panel with your new “Unread” feeds in a list on the right. Note that at this point, you have only subscribed to one feed: lindafarmer.com – so that will be all that is listed in the left column of the page. I have quite a few subscriptions and this image shows some of those alphabetically in the left column. Until you add more subscriptions, your left column will be a tad bare. If an article is particularly important to you, click the star at the left side of the headline to “Bookmark” the article within your Brief feeds. Note this does NOT save it to your regular bookmarks folders, but to the Brief tab’s Bookmarks folder. If you want to read the article on its original website and perhaps add your considered comments (it’s a good thing to do!) if it is a blog, simply click the headline and the article will open on the original site in a new tab. To empty the Trash, right click its icon, and choose Empty Trash. If you have important items you want to keep for a while, be sure to go back into Brief’s Options (see Step 4) and set it to save feeds for the length of time you want. And check out Brief’s other options now that you have a feel for how this works. The Brief icon in the lower right of your Firefox browser window will always tell you when you have new feeds (or the number you haven’t marked as read). If there aren’t any new feeds, the icon will be grayed out. I think you’ll enjoy the convenience of having the Brief RSS feed reader working for you. Now whenever you visit a site you like, you can subscribe to their feeds and have the convenience of the posts being delivered to you! Just look for the orange RSS icon in the browser bar, click it, confirm where the feed should be stored, and you’re done. Thanks for hanging in with me, and please do leave a comment to let me know how you get on. Cheers! And expect good things. Categories: Technology | 2 comments - be the next! You don’t say how to toss these feeds or any way of previewing a particular feed to see if it applies to a given situation. Example my wife is receiving feeds from a web site with job openings but I can’t figure out how to toss the feed if it is in a city too far away to consider. Hi Tom, I’m no expert but the only feeds I subscribe to are ones where I’ve actually visited the website. So I make the choice for the content I get, there’s nothing random about the content I subscribe to. In order to remove a feed in Brief, all you do is right click on the feed name on the left panel of Brief, and select “Delete Feed”. If it’s just a single entry in the feed you want to remove, you simply hit the X in the upper right corner of that item and it goes into your Trash, which you can then empty with a right click. Perhaps I haven’t understood your question well enough, but that’s about the limit of my expertise (or not!). Hope this helps. Cheers!